This briefing paper was presented to UK Parliamentarians on the 9th July 2018 at the joint All Party Parliamentary Group (APPG) meeting on Street Children and Modern Slavery. In 2016, 40.3 million people were victims of modern slavery and one in four of the victims were children. Children in street situations are often entangled in situations of exploitation which are similar to those experienced by child victims of modern slavery. Nevertheless, they remain absent in international and national efforts to tackle modern slavery. 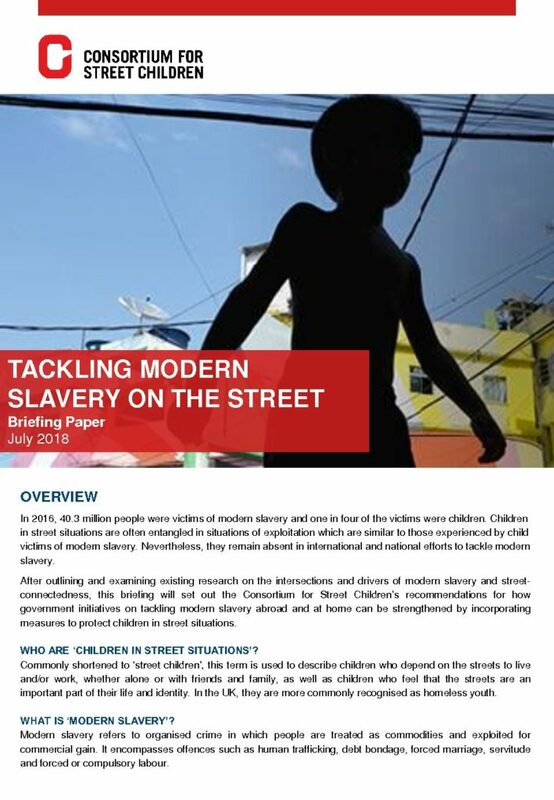 After outlining and examining existing research on the intersections and drivers of modern slavery and street-connectedness, this briefing will set out the Consortium for Street Children’s recommendations for how government initiatives on tackling modern slavery abroad and at home can be strengthened by incorporating measures to protect children in street situations. This is not an official publication of the House of Commons or the House of Lords. It has not been approved by either House or its committees. All-Party Parliamentary Groups are informal groups of members of both Houses with a common interest in particular issues. This briefing paper was researched by the Consortium for Street Children with contributions from its network members.